Bastards Of Melody will be playing at Maxwell's Tavern in Hoboken on July 2nd. The show is sponsored by Jersey Beat and we will be joined by some old friends: the Milwaukees and Eastern Anchors. Bastards of Melody will be playing at Freddy's Bar in Brooklyn on Friday, April 17th at 9:00 PM. Freddy's is located at 627 5th Ave.
Bastards of Melody will be playing at Hank's Saloon in Brooklyn on Saturday, June 20th at 9:00 PM. The Bastards will be joined by the excellent Successful Failures. Hank's is located at 46 3rd Ave, Brooklyn, NY. International Pop Overthrow (or IPO, as it has affectionately become known) is a pop music festival which has been held for the past thirteen years in Los Angeles. The IPO has also been held for various years in Chicago, New York, Boston, San Diego, Phoenix, Detroit, Milwaukee, Portland, Seattle, Vancouver, and Toronto, as well as in Liverpool, England (at the world famous Cavern Club)! Free gig at Hank's gin mill, one of the last of the great Brooklyn old man bars - not some fastidious wine bar - and these Bastards know how to fill a tiny, non-elevated stage with boisterous, punky rock 'n roll pop. The New Jersey power trio have been at this forever, yet show no slack in their enthusiasm for the Cheap Trick chunky, Replacements raspy, Sloan slapping, Posies power-pop clatter they bleed. Paul Crane is like an older, spirited cousin you clown around with, congenial, taking salient satisfaction in the spiky lift of his melodic boppers. And with a hot LP to plug for the first time in eight years, thy hit Hurry Up and Wait tunes hard - the NJ Turnpike-referencing "Exit 10" was best. Hope they earned the toll money back! Pass the hat! Bastards of Melody will be playing at the one and only Merucry Lounge in New York City on Monday, May 9th at 10:00 PM. The Mercury is one of the best venues in New York and we are psyched to be playing. We hope that you all can make it out. Bastards of Melody will be playing at The Rock Shop on April 16th at 10:00 PM. We'll be opening for one of our favorite bands - The Figgs. Advance tickets are $12 and are available on The Rock Shop website. Maxwell's is located at 1039 Washington Street in Hoboken, NJ. Please join us in celebrating the release of our 4th album "Hurry Up And Wait" on Friday, December 10th at Bar Nine (807 9th Ave) in New York City. This will be a really fun night. The Successful Failures will be starting out the night at 8:00 playing their own brand of ultra tuneful power pop/roots rock. The Bastards will take the stage at 9:00 and will be playing songs from "Hurry Up And Wait" along with some old favorites. CD's of "Hurry Up And Wait" will be available to purchase at the show. Following the Bastards show, Bunnie England & The New Originals (the world's best live karaoke band) will be taking the stage and rocking you into the wee hours. Bastards of Melody Release Hurry Up And Wait! 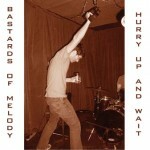 FDR Label will be releasing the new Bastards of Melody CD, Hurry Up and Wait, on 11/9/10. Hurry Up and Wait is the 4th Bastards album and 2nd on FDR. The band has also contributed tracks to nearly all the FDR Tribute CDs including a truly killer version of “The Real Me” on our Who Tribute album. Hurry Up and Wait fully realizes the band's diverse influences only hinted at on its previous releases. Featuring crunchy/jangly guitars with some folky, acoustic flourishes, melodic bass, straightforward drumming and sweet harmonies, we think this is the best Bastards album yet. The CD and MP3's will be available through all major online retailers including itunes, amazon, CD Baby, Napster and Rhapsody. You can also purchase the CD directly through the FDR Label website. Bastards of Melody will be playing our first NYC show in...well....forever. We felt the time was right for a comeback so Gil moved his poker night and Crane is taking a break from Drylocking his basement. Let the good times roll! We'll be at Ace of Clubs at 9 Great Jones in NYC. Show time is 10:00 PM. We will be joined by the awesome new kings of the Williamsburg the Radio Barons and Poison Ivy League who have an awesome bio. Here's an excerpt - "Combining hefty rock riffs with a songwriting knack for the pop hook, Poison Ivy League finds a home nestled somewhere between the Melvins and the New Pornographers." Whoa. The Court Tavern is located at 124 Church Street in New Brunswick, NJ. FDR's About a Girl CD features indie, power-pop, and garage rock bands covering the greates all-time rock-n-roll songs featuring a girl's name in the title and chorus. A portion of the proceeds will benefit the PA Breast Cancer Coalition. For more information, got to the About A Girl myspace site. HIGH SCHOOL REUNION features some of our favorite indie artists covering songs from the 80's most popular teen films. Frank Black, Matthew Sweet, Lori McKenna, John P. Strohm (The Blake Babies), Kristin Hersh (Throwing Muses), and the Dresden Dolls are just several of the great artists covering tracks from films like Pretty in Pink, Sixteen Candles, The Breakfast Club, Fast Times at Ridgemont High, Say Anything, Valley Girl, Repo Man, and more. The 80's were unique. There were so many important films that spoke to us as teenagers. The soundtracks were exceptional, and the stories & characters unforgettable. You provide the star power!! !